The Music Ministry at St. Luke's has been very busy since restarting in September. At every mass, the choirs have been singing a Prelude Hymn prior to the start of mass and a Song of Praise after Communion. Furthermore, the choirs and musicians worked very hard to prepare a beautiful Christmas concert that was great fun for the choirs and congregation. 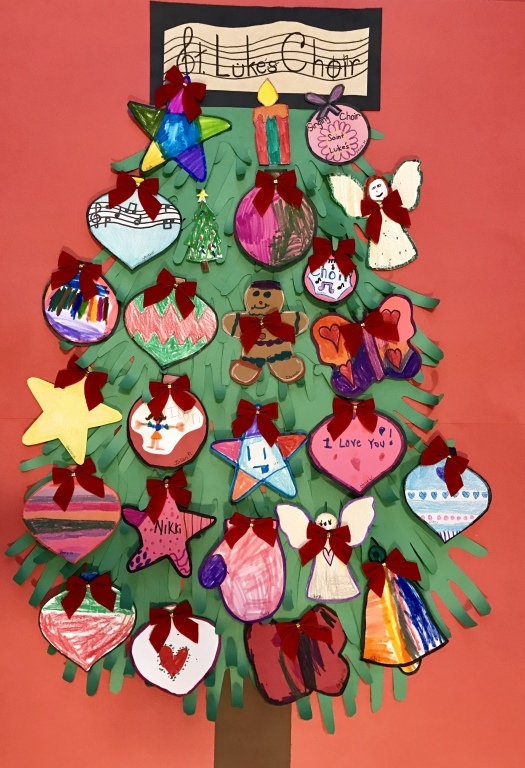 Under the guidance of our art mentor, Margie Jorden (a choir grandmother), the children's choir members drew, designed and colored handmade Christmas decorations. Margie traced all of the children's hands, cut them out using green colored construction paper and created a Christmas "tree" out of the fingers and hands. Margie put the decorated ornaments on the tree that was displayed in the nave of the church during the Christmas season. Furthermore, a picture of the tree was used for the front page of the Christmas Concert Program. One of the SLYC (St. Luke Youth Choir) members drew "St. Luke's Choir" using musical symbols instead of letters that became the "star" on the top of the tree. For 2019, the choirs will continue to learn new hymns and anthems as well as prepare for Lent and Easter. Further highlights include singing for First Communion services, as well as Mother's and Father's Day. The children will prepare other art projects with Margie to give as gifts to their parents on their special days. The Adult Choir is looking forward to singing the beautiful and powerful anthems and hymns during Holy Week. The week begins with the triumphant celebration of Christ's entrance into Jerusalem on Palm Sunday followed by the solemn ceremonies of Holy Thursday, Good Friday, and the Easter Vigil. The end of Holy Week brings the glorious and joyful Resurrection of Christ on Easter Sunday, celebrated with beautiful anthems and hymns. Some of the musical highlights of the week include the meaningful "In Remembrance" by the Adult Choir, "The Rock That Rolled" (written by parishioner, CCD teacher and guitar player Joe Colavita) sung by SLYC and "Alive Forevermore", sung by the Angel Choir (ages 4-6). When the choirs finish their seasons in mid-June, celebrations are held honoring the year of service, commitment and dedication. We are looking forward to seeing new faces! As Fr. James reminds us, singing is praying twice!